I spent much of June in the Frankenjura (Germany) with my family. 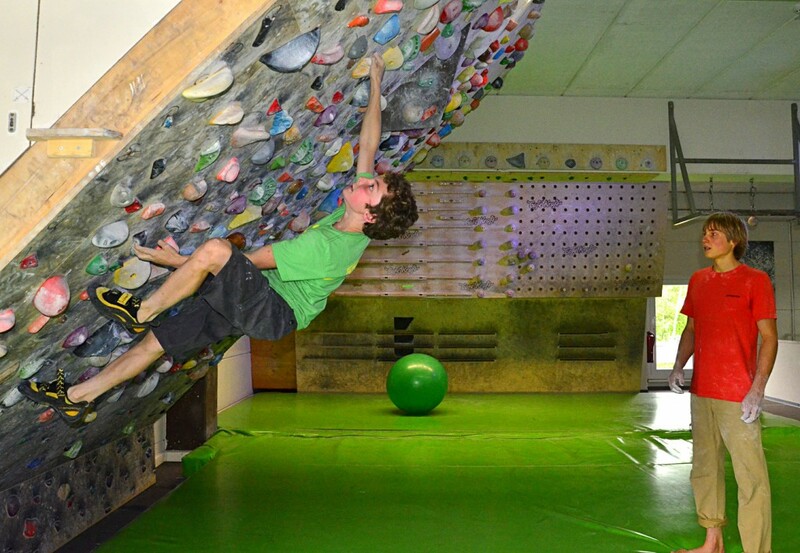 Besides climbing on the notoriously small-pocketed and powerful limestone sport routes of the Frank, we were able to spend quite a bit of time with our friends at Nürnberg’s world-famous Café Kraft bouldering gym. Café Kraft coaches Dicki Korb and Patrick Matros are authors of Gimme Kraft—quite likely the climbing world’s best selling training book the past two years—and they coach several of the world’s top climbers, including young phenom Alex Megos. 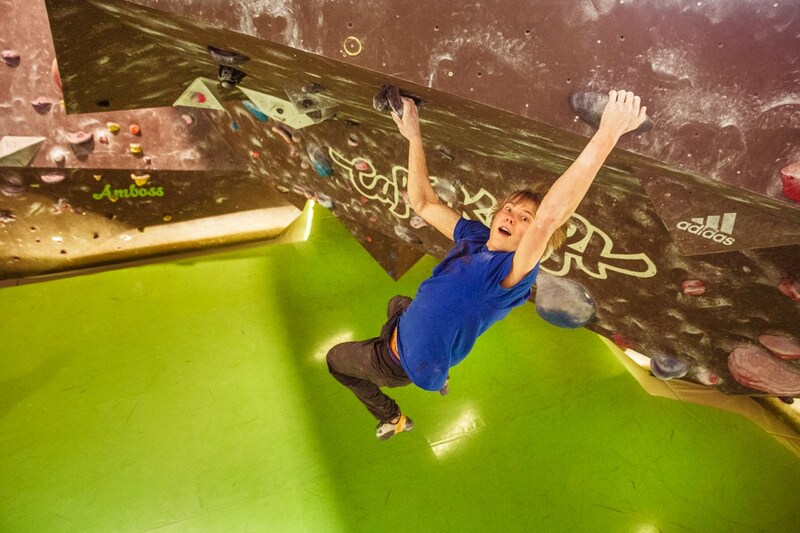 After a few days of indoor training, outdoor climbing and lots of energetic conversation with the Café Kraft crew, I decided to shoot a short video interview with coaches Matros and Korb. 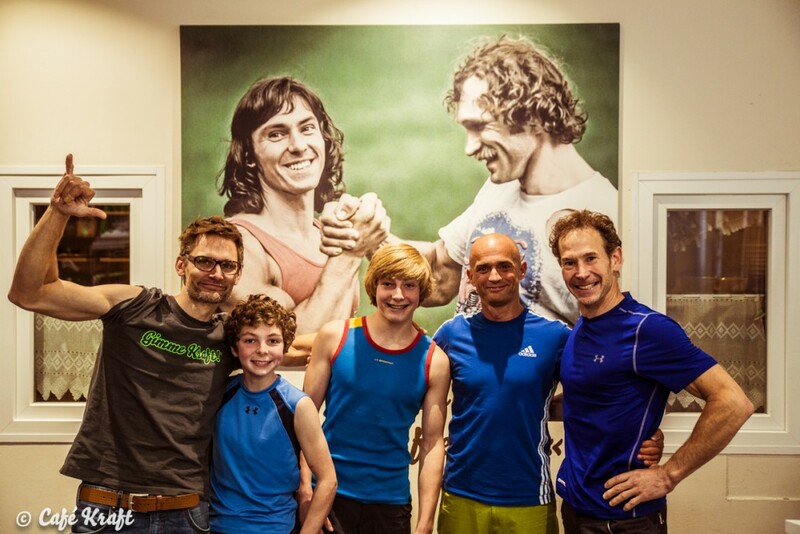 Coaches Korb and Hörst…and Alex Megos and Cam Hörst. 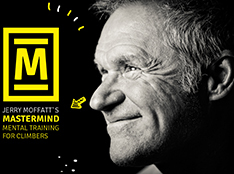 The 28-minute video interview (below) covers a lot of territory ranging from the coaches’ philosophy of training (and their role as a coach and friend to the trainee)…to how they have trained Alex Megos over the past 9 years….to the importance of developing a balanced training program with a long-term success and sustainability in mind. 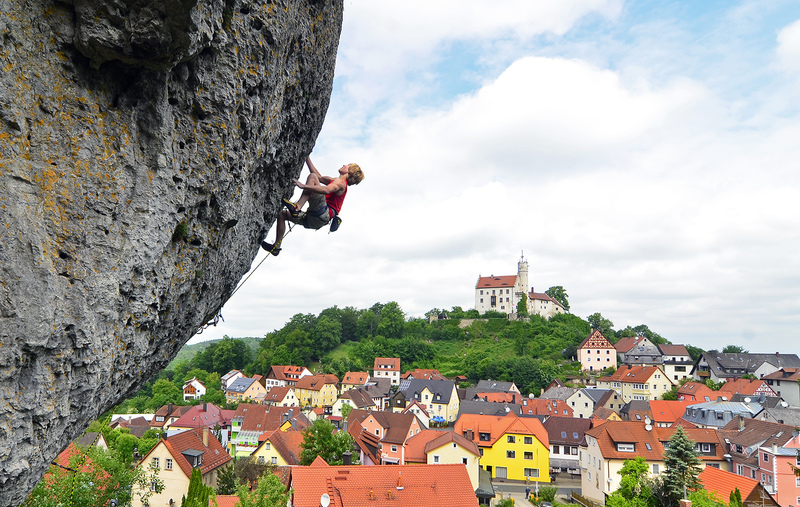 And given that Nürnberg is the birth place of Campus Training, it was imperative that we chat on this topic with some expert advice (and words of caution) for would-be “campusers.” The interview wraps up with a few tips for beginning climbers (and others) wanting to begin a training for climbing program. 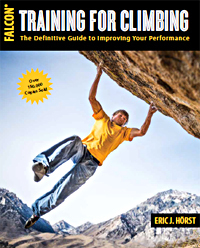 Given that coaches Korb and Matros (and myself as well) believe strongly in personalized training program design—rather than issuing generalized training “blue prints” or detailing some rock star’s program (inappropriate and potentially injurious to the average climber)—we intentionally steered clear of getting into training specifics and the nuts and bolts of program design. 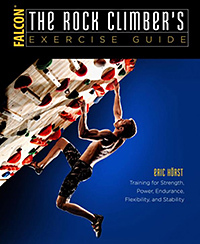 Still, I trust you’ll find our conversation interesting and thought provoking, and hopefully it will motive you research and develop an appropriate, well-rounded, and effective training-for-climbing program. Matros’ and Korb’s book Gimme Kraft! 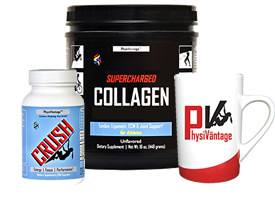 provides crisp detail on dozens of unique exercises that form the foundation of their training programs—check it out! 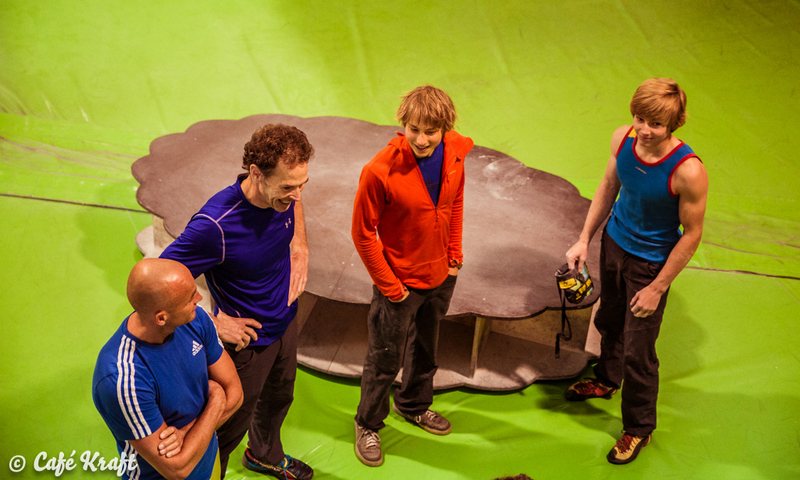 Interview with Coaches Patrick Matros and Dicki Korb from Training4Climbing. 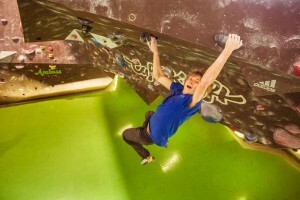 Jonathan Hörst and Alex Megos training at Café Kraft. Hannes Hüch, Jon Hörst, Cam Hörst, Dicki Korb, and Eric Hörst at Café Kraft Nurnberg, Germany. 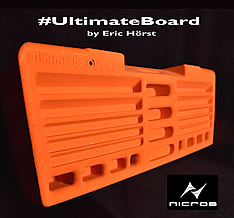 Copyright © 2015 Eric J. Hörst | All Rights Reserved.